The combination of Apple's earnings warning and the two-year low in the Manufacturing ISM was a Black Swan event for the market. A black swan is a major event that nobody expects and catches the market by surprise. Apple had not warned on revenue in seven years. Despite the constant news from the various suppliers on cancelled orders, nobody really believed Apple was in trouble. There are always manufacturing rumors and Apple has always seemed to pull a rabbit out of their hat to beat estimates. This time it is different. Apple originally guided for $89-$93 billion in revenue and analysts were expecting $91.5 billion. Their guidance warning is now targeting $84 billion. That is a significant miss for a company the size of Apple. Apple said 18% of their business comes from China and revenue from China declined 25% over the last two months. They also blamed a lot of other factors but falling sales in China was their main complaint. This came in the same week that China's economic numbers declined to a multiyear low and broadened expectations for a larger global slowdown. On Thursday the US ISM Manufacturing for December fell from 59.3 to 54.1 and the lowest level since late 2016. Suddenly the global slowdown scenario picked up speed. The slowdown in China was confirmed by weakness in Europe and now in the US, which is supposed to be the strongest economy. This sudden apparent confirmation of economic weakness in multiple geographies was the black swan nobody was expecting. 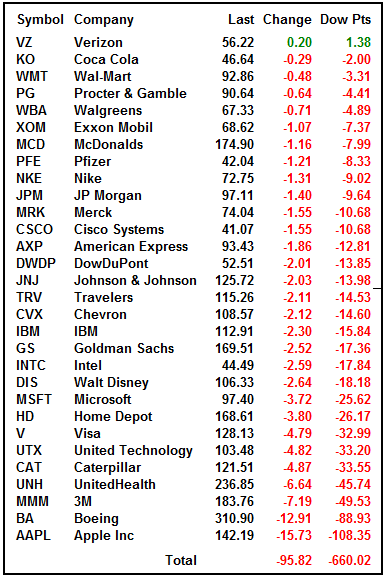 Add in the multiple people in the US administration warning about China's aggressive behavior, biggest threat on the planet, need for more tariffs and the state Dept warning about travel to China and investors could not get out of stocks fast enough. The Dow fell -660 points and closed at the low for the day. The Nasdaq had another 200-point decline. 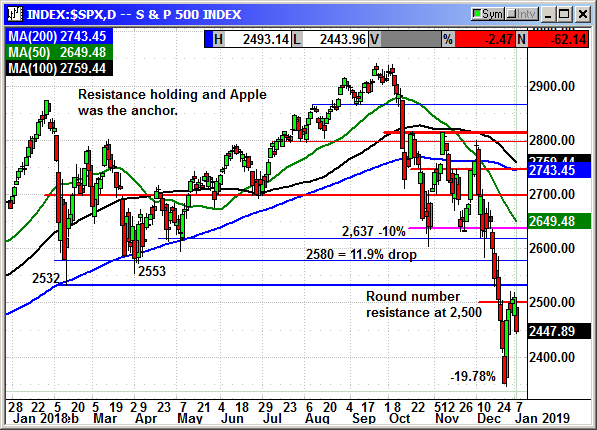 Resistance just over 2,500 on the S&P proved fatal for the short-term oversold bounce and the index fell -62 points. There may be another short squeeze or dead cat bounce in our near future. 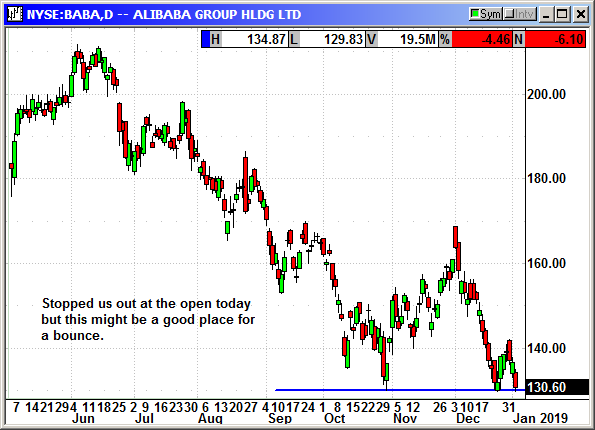 However, the China weakness, global weakness, story is alive and well and will more than likely com back to haunt us. With 600-900 point intraday swings, this is not a premium selling market. I am not adding any new plays until the volatility declines and a trend appears that last more than three days. We could be headed for a retest of 2,350 on the S&P or another attempt to punch through 2,500. Either way these monster intraday moves, normally in opposite directions are too dangerous to play unless you are a day trader. The Apple revenue warning and claims that business declined sharply in China over the last two months, hit Aliababa hard and caused a $6 or -4.5% decline on Thursday. This stopped us out just after the open for a breakeven. The market continues to be crazy with 500-1000 point intraday swings. We are holding just above the lows. Selling premium in this market is suicide. This is still a high-risk market for premium sellers. The volatility continues to be extreme. 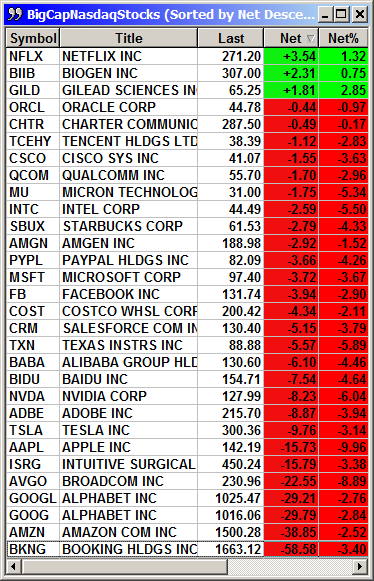 I am not recommending covered calls this week.